FBD Insurance Rás leader Chris Newton made history today when he became the first overseas rider ever to win two editions of the race. The GB-Recycling.co.uk rider finished safely in the main bunch on the final stage, a one hour circuit race in the Phoenix Park, thus preserving his 14 second advantage over former Tour of Spain points jersey winner Malcolm Elliott. 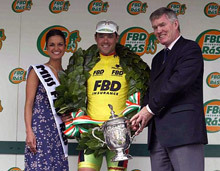 Newton was delighted to add to his 2003 Rás title. "I came into the race thinking my form was good, but not great," he said. "Taking three stage wins plus the overall is special. It's great to win this event again, the Rás is a super race."